For some reason on the site it says it's a Wilko brand but I just bought one in store and it was a Schwartz branded version not Wilko, however it looks the same as the one on the site. 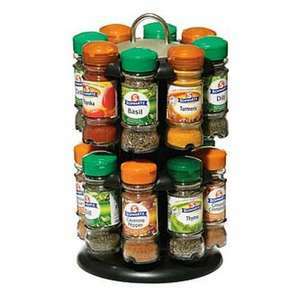 It's a two tier rotating spice rack and includes 16 Schwartz herb & spice jars. I know there's a £4.95 shipping fee to buy from Wilko online but these are available in store so save yourself the shipping and go get some sun at the same time. Herbs & spices includes; mixed herbs, basil, parsley, oregano, paprika, cinnamon, tumeric and many more. Considering most of these jars cost in the region of £1.60 then you're basically getting the rotating rack for free. If it's the spices you're after (rather than the rack), check out your nearest asian supermarket; you'll probably get bags of 100g+ of spice for 50p and up.